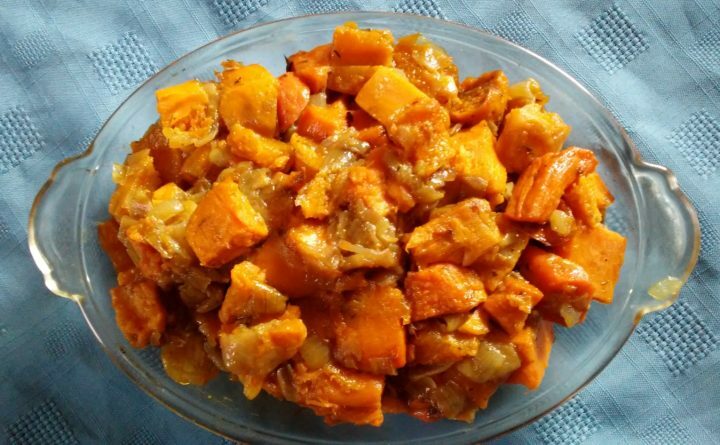 Golden Vegetable Casserole uses seasonally available root vegetables to make a hearty and filling dish. Butternut squash, carrots and sweet potatoes meet up in this easy-to-make casserole. Onion and a little thyme makes this dish savory. Enhanced with brown sugar and moistened with cream, this recipe is flexible enough to accommodate a variable supply of orange winter vegetables. While carrots, squash and sweet potatoes are available in the produce section of the grocery store, if you are a farmers market regular you’ll find plenty of carrots and winter squash this time of year. You might even find Maine-grown sweet potatoes. If you are a community-supported agriculture (CSA) member, your winter delivery probably includes carrots and squash. Maybe even too many of them! My butternuts, harvested last fall and stored for winter in a cool dry room, are in reasonably good condition even now, though I need to eat them soon. I save my harder-skinned acorns for later. Carrots keep well in the cellar. If I observe the butternuts showing little soft spots, I can whisk them into the kitchen, skin them, cut them into cubes and freeze them like I do berries in a single layer until hard, then scrape them into sealable bags and toss them back into the freezer, ready to use. For this recipe, you will want a blend of vegetables, but feel free to use more squash than sweet potato, or vice versa, and however many carrots you choose. One cup of each and you’ll have enough for three to four servings. Double or triple it for more people. If you have any left over, (and no one said you can’t make leftovers on purpose; I do it all the time) add chicken or vegetable stock to thin it out; puree it; add black beans or bits of ham, cooked chicken or crumbles of cooked burger; and voila, a hearty soup. Just like that. Because the carrots are harder than the squash or sweet potatoes, you need to cut them into smaller pieces or parboil them. Your best bet with this dish is roasting the vegetables at a high temperature (450 degrees) for 15 minutes or so, then assembling the casserole to bake, though you can saute the vegetables on the stove before assembly, if you prefer. 1. Heat oven to 425 degrees Fahrenheit and drizzle oil into a roasting pan. 2. Arrange the vegetables in a single layer and roast, turning once, for about 15-20 minutes or until they are tender enough to pierce with a fork. 3. Saute the onion until just soft, about 5 minutes, and set aside. 4. In a bowl or in the roasting pan, mix together the vegetables, onions, thyme, brown sugar, and salt and pepper to taste, then put them in a baking dish. 5. Reduce the oven temperature to 350 degrees Fahrenheit. 6. Drizzle the cream over mixture and return to the oven for about 30 minutes, or until the vegetables are tender.